This film officially wrapped up the end of the series of films at one of my local area theaters who showed several Science Fiction classics throughout the month of April. All of which (with the exception of “Blade Runner” (1982) which I chose the original “Alien” (1979) over as the two were playing on the same night) that I got to see on the big screen. Which has become a new passion of mine in revisiting some of the older classics for the first time in the theater. I’ve added several Sci Fi classics to my “bucket list” and it was some of the most fun I’ve had at the movies in quite some time. In this past month plus some I saw Steven Spielberg’s “Close Encounters of the Third Kind” (1977), as mentioned above, Ridley Scott’s “Alien” (1979), James Cameron’s “The Terminator” (1984), James Cameron’s (x2) “Aliens” (1986), and the recently released “Ex Machina” (2015). Alex Garland’s cerebral head trip which wound up being the best Sci Fi film I’ve seen since Duncan Jones’ groundbreaking “Moon” (2009). 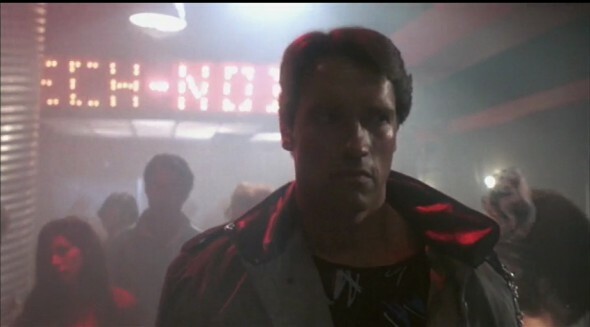 I have to admit the “Terminator” franchise is one of my least favorite Science Fiction ones as I remember watching them as a kid, and while I admired the second one, I really never could find myself getting into any of the subsequent sequels. Similar to how I felt and still feel about the “Alien” franchise after its second installment. That and to be perfectly honest, I don’t even really remember seeing the first “Terminator” except for maybe bits and pieces when I was a just a young lad. And in thinking back my reason for not doing so probably had a lot to do with the fact that I saw the films out-of-order, with the second one first, then the third, and fourth. Since I didn’t much care for parts 3 or 4 seeking out the first one wasn’t necessarily high on my list. At least in my more formative years. Though since then, in becoming a student of film, I’ve come to learn that the original is highly regarded in many film circles to be one of the all time classic entries into the Sci Fi genre. So I thought to myself I should make it a point to check it out, now that I look at films analytically, to see if it earns the moniker of being up there with the all time greats like some of the ones mentioned above. James Cameron’s debut film is a dark, dirty, post-apocalyptic vision of the future that seems very much influenced by the many films of the genre that came before it. Films like John Carpenter’s “Escape From New York” (1981) and Ridley Scott’s “Blade Runner” (1982) both seem like direct influences on it in terms of look and style. Except where those films were much brainier, Cameron seems to change the playing field a bit here. Not really caring much for character or plot, he appears to be much more interested in style and sheer entertainment value. As there’s not really much on display here in terms of any kind of narrative. What’s different, and done quite I should add, is his ability to bring an almost new kind of kinetic energy to the genre. His ability to engage the audience while keeping the cat and mouse plot moving along from scene to scene is really the film’s greatest strength. In relation to some of the other big-budget pics of the genre, this film in especially feels more sadistic, but with a certain playfulness about it with its splatter-violence and singular vision that I call “cyber punk”. In terms this vision I speak of it breaks new ground in the genre with its seeming admiration for over the top violence and energy. Something I hadn’t been privy to of some of the more contemporary films of the genre up to that point in film history. It’s maybe the most visceral and action packed genre picture for its time. There’s also the flat-out bad acting but which actually suits itself well to a story that doesn’t seem one bit concerned with how the actors come across but based much more around visual style and hyper violence. Arnold (Ahnuld) Schwarzenegger and Linda Hamilton read their lines like they’re reading off of a teleprompter (though to his credit Schwarzenegger has maybe only a dozen or so lines in the entire film). The best thing about it acting-wise was the other cyborg sent from the future played by Michael Biehn, who gives some life into what is otherwise a pretty laughable script. Though at times I felt like it reveled in the irony of its poorly acted script. The Schwarz seems perfectly cast as his bland facial expressions, thick accent, and Frankenstein body language suits itself rather well to the role of a menacing cyborg. Hamilton on the other hand is more of a feast for the eyes, as she clearly seemed to be cast more for her gorgeous looks (lucky you Cameron) than for her acting chops. What I will conclude by saying, is that while “The Terminator” is considered to be a master work and essentially the platform for starting James Cameron’s career. It also marks the turn of big budget Sci Fi going for a more action packed, style over substance, entertainment thrill ride approach. Which for the most part it succeeds in doing. Its influence is embedded in several Sci Fi films that proceeded it. As did its kitschy one-liners (“I’ll be back”). But for all of its nicely looking visual splendor and style it feels devoid of the brainer elements that I’ve learned to love from the genre. So for that mostly personal reason, it wound up being fun to watch and critique. But in terms of its place as being considered one of the “the greatest” Sci Fi films to me it barely makes the cut. That aside, I could still sit back and both admire and understand why its considered such an important work for its time. It is very difficult to talk “fact” when it comes to film. However when it comes to Science Fiction, one could say the closest thing to being fact is that Stanley Kubrick’s “2001: A Space Odyssey” (1968), Ridley Scott’s “Alien” (1979), and Scott’s “Blade Runner” (1982) are the three most influential films to have come out of the genre of all time. And I would argue that all three of them are also the best. But when it comes to using the term best in relation to film, well, that’s a matter of opinion of course. What I will say is this – the fact that I got to see James Cameron’s “Aliens” (1986) and its predecessor within the same month, on the big screen no less, is maybe by a mere act of god. But even more importantly, that I came to the realization after seeing both screenings, of how incredibly influential both films are. Not just in terms of their importance in film history, but in how much of an impact the “Alien” franchise has had on our culture and society as a whole. When I saw “Aliens” (1986) a little under a month ago now, I was awestruck by the vast number of people who came out to see a movie that was made almost 30 years ago now. I remember casually getting to the 750-person capacity theater 45 minutes early thinking that I would be one of the first in line. It turned out there were probably 100+ people in front of me. The movie eventually sold out, mind you again this is for a theater that seats 750 for a film that was made almost 30 years ago. It was an experience that’s difficult for me to put into words. It all felt so all inclusive. Like I was an integral part of something special. Which is truly one of the main reasons why I enjoy going to the movies so much, to be a part of that kind of experience. As was the case with tonight’s screening of “Alien” (1979). Granted I showed up late (if you want to call a half an hour “late”) and was more shocked this time than I was the previous time to see the sheer amount of people in line to see it. This time being at a much larger venue, at Portland’s Empirical Theater which is within our city’s science museum, and seats about a 1,000. Well even arriving a half an hour early I was a few hundred people back. The scene there looked like something more akin to a big rock concert than it did to see a film that was made 36 years ago now. But what struck me even more about it was the age range by the looks of the people waiting in line. Everyone from teenagers to people my age to older adults stood in line at their chance to catch this film live on the big screen. Many of whom like me, were experiencing it for the first time. What’s so significant about this and why I feel the need to point it out is that movies really are timeless, and to see such a film with such a large audience that has made such a lasting imprint on our culture was nothing short of amazing. It finally came time to pile in when the usher announced by megaphone (there really were that many people in line) it was time to be let in. People scrambled in like cattle and to be honest, I just felt lucky enough to have gotten a seat. I buckled myself in as the house lights went down, which conjured up a sense of excitement that only a film of this caliber could possibly summon. It’s at this pivotal moment and iconic scene that virtually the rest of the film takes off. Scott produces genuine thrills and scares as the film essentially becomes a game of cat and mouse, with the alien preying on the rest of the crew. And each time we see the beast’s double set of extending jaws, the movie becomes more and more terrifying as each unfortunate victim befalls resulting in one of the more fulfilling climaxes in cinema history. The film’s true greatness lies within its ability to be both undeniably scary, nerve-wracking, but even more importantly, as a piece of thought-provoking art. The Oscar nominated visual effects by the late H.R. Giger are both highly original and unique. That and unlike its sequel, we hardly ever get to see the actual alien, except only for a few brief moments at a time, and it’s both terrible and beautiful when we finally get to see it in its full form. Another key important thing to note is that is was solely responsible for launching its then unknown actress Sigourney Weaver into an overnight star and film icon. I could go on and on and on about the many things I love about this film, but I don’t think I could possibly do it justice. What I will say is with each viewing, especially this one, given that it was on the big screen with a house full of “Alien” fans like myself, it acted as a reminder of why I hold this film in such a high regard. But even more so, it’s a glimpse into the past at one of the most seminal and important works that would go on to influence generations to come. Writer/Director Neill Blomkamp burst onto the scene in 2009 with the Science Fiction game changer, “District 9”, which many could say (minus maybe Duncan Jones’ “Moon, also released that same year), is one of, if not the best Science Fiction films of the past decade. It carved out a new niche in Science Fiction infusing faux-documentary elements, guerilla filmmaking, and a visceral-like quality usually only found in War films. It also contained many allegorical themes, mainly using his story of alien life forms who land on earth only to be ousted and pushed into “ghettos”, clearly Blomkamp’s take on the rising number of illegal immigrants and how they are treated once they enter into this country. Blomkamp’s follow-up, 2013’s “Elysium”, once again saw Blomkamp digging into more allegorical themes in a movie about classicism and two planets that separate the rich from the poor. “Elysium”, at least in my opinion (and most likely the opinion of everyone else) wasn’t half the film “District 9” was. But that would have been a tough feat to pull off. Considering how influential the former film was. 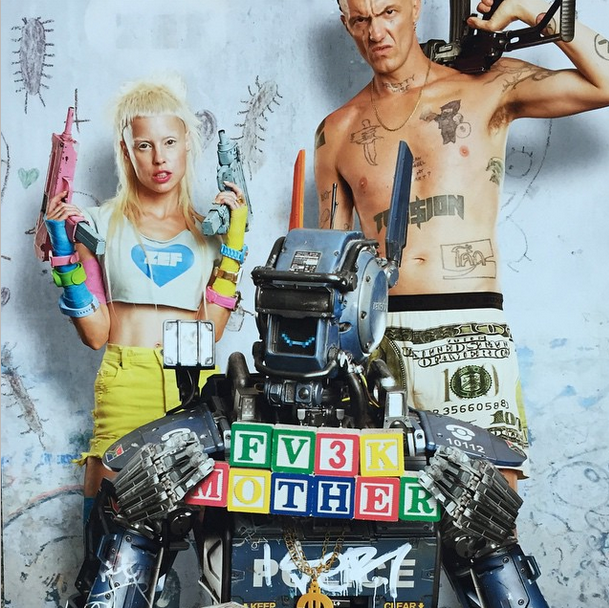 As for his more recent film, what first piqued my interest about it a long long time ago was that film news websites were saying things like “Neill Blomkamp teams up with rap/rave group Die Antwoord on his newest film”. I immediately took notice as many people who know me know how much of a Die Antwoord fan I really am. And it seemed to make sense that the most unique voice coming out of Africa in film would team up with the most popular musical group from the same country (that and both Blomkamp and Die Antwoord have expressed their deep love and admiration for one another to the press). It was only befitting that the two would team up for a film. What also drew me to this particular project, despite its less than favorable reviews, was not only the casting of Die Antwoord (Ninja and Yolandi Vi$$er), but Hugh Jackman (who I have a newfound respect for because of 2013’s “Prisoners”), the legendary Sigourney Weaver (any Science Fiction director’s dream to have cast in their film), Dave Patel from “Slumdog Millionaire” (2008), and finally third-time collaborator Sharlto Copley (playing the voice of the robot of the titular character. Even in spite of it not getting such great reviews, given the film’s pedigree it was almost a given that I would see it while it was still in theaters. The film first introduced us, as did “District 9” did, to a decaying, crime ridden Johannesburg, South Africa. And through a series of interviews with Ph.D types, discusses the city’s elite police force, robots which are manufactured by a company called Tetravaal. The company is the leading distributor of the droids. Within the company there are two developers, Deon (played by Dev Patel) whose sight is set on making a more human-like robot. One that can think and feel emotions on the same level that humans do. The company’s other developer, Vincent (played by Hugh Jackman) has developed his own machine called MOOSE, which can be remote-controlled and handled solely by the company employee’s themselves, which puts the two in competition. Both developers are assets to the company, but are given very little help financially in getting their prospective projects off the ground by the head of the company, Michelle (played by every Science Fiction director’s dream of having her star in their film – Sigourney Weaver). A shift in plot brings us to a visceral car chase scene after a drug deal whose occupants include both Yolandi Vi$$ser and Ninja from Die Antwoord, playing fictionalized versions of themselves (or are they?). Ninja is threatened and told by the city drug lord, “Hippo”, that he needs to pay back $20 million dollars lost in the deal or else they will both be killed. Desperate and not knowing what to do, Ninja and Yolandi come up with a plan to kidnap Deon so that he will help them manufacture a killer robot to help them pull of a heist so they can pay back the money the $20 million they owe. It’s at about this same time that Deon finally figures out the right formula to create his project of making a robot that closely resembles a human. While in transit of taking hardwired parts to make said robot, he is kidnapped by Yolandi and Ninja and taken to a remote, abandoned factory in which he is forced at gun point to create this human-like robot by the two gangsters (or shall I say “ganstas”), and completes putting together a robot that can mimic humans of whom they name “Chappie”. After doing so, Deon isn’t needed anymore, so Chappie becomes Ninja’s and Yolandi’s project in teaching and training him to become the first robot “gansta”. So that they can use his bulletproof armor and apathetic conscience to pull of the heist that will allow them to pay the money back. Does the premise of creating the world’s first A.I. gangster sound silly? It sure does. But it’s also a heck of a lot of fun if you don’t take the movie too seriously (which I think is what turned off many critics about it). This is essentially Die Antwoord’s film. Both Yolandi and Ninja get the film’s most screen time, and for a musical duo of non-actors (except for their starring role they did a few years back in a short filmed by Harmony Korine) their characters are mostly drawn out well and come across as believable. Both artists/actors essentially play themselves, and Blomkamp seems to have clearly been inspired by the group’s aesthetic. As everything from the set design, music, graffiti, costume, and film’s music seems lifted from what I call the Die Antwoord aesthetic (otherwise known as “Zef” culture which broken down into laments terms is the band’s own “gangsta” lifestyle). The two of them essentially teach and educate Chappie on said lifestyle, which is in conflict to his creator Deon’s, who wishes for a more law-abiding and morally conscious Chappie. It’s within these so-called “training” scenes in turning Chappie “gangsta” that the film produces its most laughs, poking fun of itself and never seeming to take things too seriously (much like the band members themselves). Yolandi takes on the role of “Mummy” to the robot and Ninja taking on the role of “Dada”. Ninja being the one most responsible for turning Chappie into a gangster robot (imagine a robot version of James Franco’s “Alien” from Harmony Korine’s “Spring Breakers”). It’s from here that the plot grows increasingly more and more preposterous, as Chappie is conflicted by both the “gansta” lifestyle of his kidnappers and the more morally conscious embodiment of his programmer Deon, who desperately tries to get him back. I had a lot of fun with this film, even though as hinted at I’m partially bias being in that I’m a fan of Die Antwoord, whose performances in the film are borderline if not full on self-parody, which I found amusing and interesting to watch when put into the context of the film. It also has a great electronic throbbing score by the legendary Hans Zimmer (whose work up to this point in film composing has always been more orchestral). The concept of the film itself is strong enough even if the plot is jarring and the execution seems funny and pointless. This wound up being a film that I was much more entertained by than I was in its ability (or lack thereof) to be believable or to be taken too seriously. As you have to suspend quite a bit of disbelief to enjoy it. As I was able to going into it which ultimately wound up being the case here. I wouldn’t necessarily recommend this to anyone, except for die-hard fans of the genre and even more so, fans of Die Antwoord. But for those looking to kick back with something that doesn’t require much thought on behalf of the viewer other than to be somewhat of a standard slice of contemporary Science Fiction, I can assure you there are a lot worse ways that you can spend your time outside of watching this film. However, that being said, let’s just hope that Blomkamp takes his next project, the “Alien” reboot, a bit more seriously as he’s going to have quite a bit of fine tuning to do. People ask me all the time what my favorite horror film ever is. I tell them “the answer is easy, Alien“. Then they’ll ask me what my favorite Science Fiction film is of all time is and I’ll provide them with the same answer. When people ask me what my favorite action movie of all time is my answer has always been the same – Aliens. Then people will often times ask me what my second favorite Science Fiction film of all time is and again, my answer to them is always the same – Aliens. I hold the first two Alien films in the same kind of regard that most people hold Francis Ford Coppola’s “The Godfather Part 1” (1972) and “The Godfather Part 2” (1974) in. What’s so great about the first two “Alien” films is their ability to combine different genres and craft them so perfectly in the way that they do. The first “Alien” (1979), directed by Ridley Scott, and the second, “Aliens”, directed by James Cameron, couldn’t be more different from one another. So that’s why much like the first two “Godfather” films, you’ll find that you meet people who are almost split down the middle or completely divided as to which one they like better. Because they’re both really just so goddamn good. What the first film did so well and why it was and still is so revolutionary for its time is was because it took what was otherwise a cheap genre of the time – the “scary monsters in space” one, and gave it new life adding in exquisite cinematography, a high budget production value, and a mood, feel, and tone that was both downright nerve-wracking and completely terrifying. Director Ridley Scott produced genuine thrills and made incredibly tense dramatic use of the film’s claustrophobic corridors. 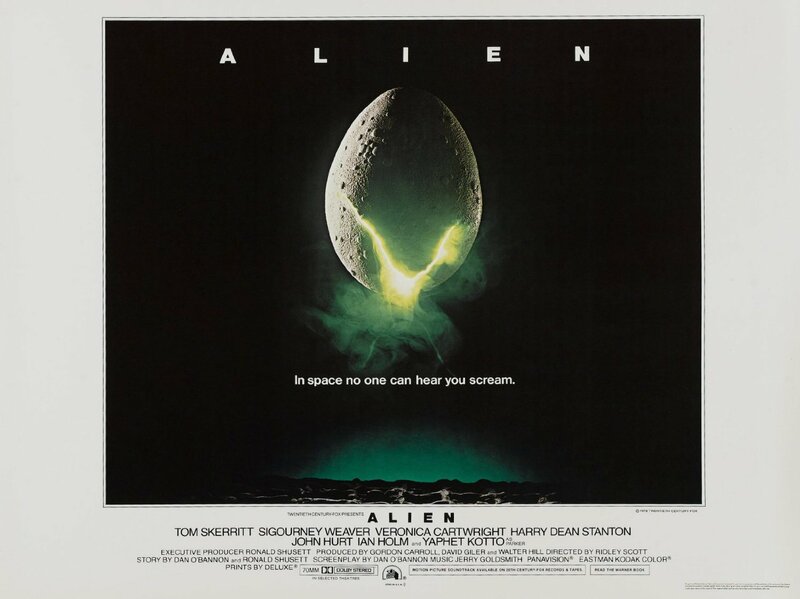 The first “Alien” also had both an originally unique and brilliant set and art direction along with Oscar-winning visual effects, with one of the most creatively designed looking creatures in genre film created by the late, great H.R. Giger. It also gave birth to star Sigourney Weaver, making her in almost international icon and feminist leader overnight. About a year ago I was lucky enough to have been given the opportunity to see the original “Alien” on the big screen for the first time, and I have to admit my experience with it that particular night, seeing it among a sea of movie buffs and fans like myself was really something hard to express in words. It was as if I was seeing it for the first time in the way that it was always supposed to be seen, in a packed, dark theater that was so quiet you couldn’t hear a pin drop. A perfect (and really the only) way to see a film in my opinion. My experience that night was so great and left such a lasting impression, that I vowed to myself that I would jump at the opportunity to see the second one under a similar setting if I was ever given the chance to. Well lucky for me there’s a local theater up the street from where I live that specializes in showing A+ quality prints of older films. To give people like myself and others a chance to see some of their favorite films that they were maybe too young to see or in a lot of cases, weren’t even born yet a chance to see some of their favorite pictures on the big screen for the very first time. And boy do people come out of the woodwork and pile into the theater in droves when these events take place. I’ll put it this way, I was taken aback when I showed up a full half hour before showtime, to a theater that seats almost 1500, and found a line around the block of people waiting to get tickets. Luckily I had got there in enough time, because by 20 minutes before the movie started, I looked around and saw that the theater looked completely sold out. Mind you for a movie that was released in 1986 almost 30 years ago. After a bit of discussion with a fellow film aficionado like myself about the reason why we were there, which was essentially the same, to see one of our all time favorite films on the big screen, the house lights went down and the movie started which was met by quite a bit of applause by its 1500 person capacity theater. James Cameron’s sequel, which also happens to be arguably one of cinema’s greatest ones, picks up where the first one lets off and finds Lt. Ellen Ripley (Weaver) being recovered in the space craft pod that she put herself in at the end of the first. It’s 57 years later, and Ripley is unfrozen by a military-like group of explorers. This so-called team, led by a great supporting cast of Michael Biehn (who the audience applauded for when his name came up in the opening credits), a young scene stealing Bill Paxton, the iconic Lance Henrikson (who plays the team’s only android – like Michael Fassbender in the prequel “Prometheus” (2013)), and the slimy, lecherous Paul Rieser, who plays the sort of corporate leader in charge whose agenda may be much different from that of the others. 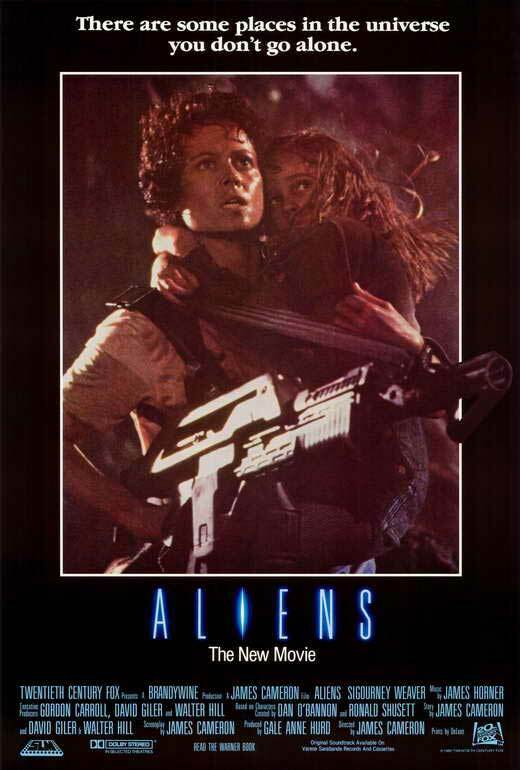 An agenda which includes Ripley being sent back to the former colony from the first one with a rag-tag group of soldiers to see what happened to the planet and investigate to see if it still contains any of its former inhabitants. If Ridley Scott’s first entry was more of a haunted house space frightener, James Cameron’s sequel is much more visceral, relentless, and furiously intense. More akin to an action packed thrill ride in which we get to see a lot more of the creatures that come in at about the half hour mark and stay for the entire rest of the film in one suspenseful and thoroughly entertaining scene after the next as the team is confronted with each of the many creatures. Culminating in one of the most exhilarating climax’s and ending sequences in maybe any movie I can think of as Lt. Ripley fights off the mother of the species. As the movie ended and the credits rolled it sounded like every single person in the entire audience was clapping. Which to me is one of the best reasons to see such a beloved film such as this one on the big screen. 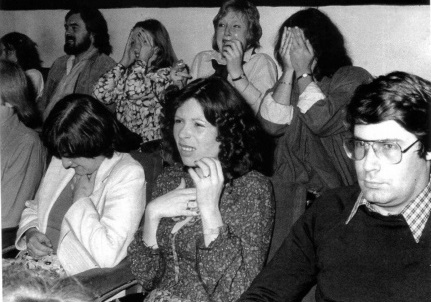 As you can feel like you’re transported to another place and time almost 30 years ago where one can only imagine the audience might have had this very same reaction. A reaction of almost everyone leaving totally satisfied with a buzz in the air that at least in the humble opinion of this writer, is very hard to find outside of one of our last remaining experiences that can be collectively shared by a group of people in real time. And to me this film is one of the all time greats and yet another fine example of the everlasting power of cinema.